Just be careful how hard you Ollie on that thing! 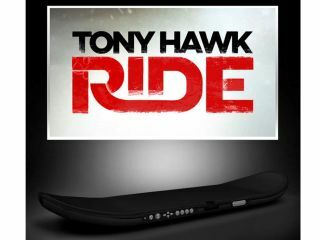 Activision has unveiled the new Tony Hawk game, along with an intriguing looking 'digital skateboard' peripheral, following numerous rumours over recent weeks that such a peripheral was in the works. It's a risky move, for sure. For skaters and fans of skate games out there this means one of two things – Tony Hawk Ride will either be the best skateboard videogame ever made (thus consigning EA's next Skate game to the bargain bucket) or it will be an unresponsive gimmick. And thus flop. The stakes (skates!) are high, as this has been one of Activision's most profitable franchises in recent years and a flop for Ride could kill the reputation of the Hawk brand amongst fickle gamers, who remember little other than the last outing in the series. "This is either the smartest, or stupidest, thing Activision have ever done," agrees US gaming blog, Kotaku. The announcement was made on the latest episode of GameTrailers TV in the US. The game will ship on 360, PS3 and Wii. Expect more details and the first hands on previews from E3 early next month.